Puck Pentenga dribbles the ball. The junior midfielder was named Big Ten Offensive Player of the Week after scoring three goals and assisting on another last weekend. Puck Pentenga was named Big Ten Offensive Player of the Week after tallying three goals and one assist in two weekend games. The junior midfielder is the second Northwestern player to receive the honor this season after sophomore defender Kirsten Mansfield earned the designation in September. 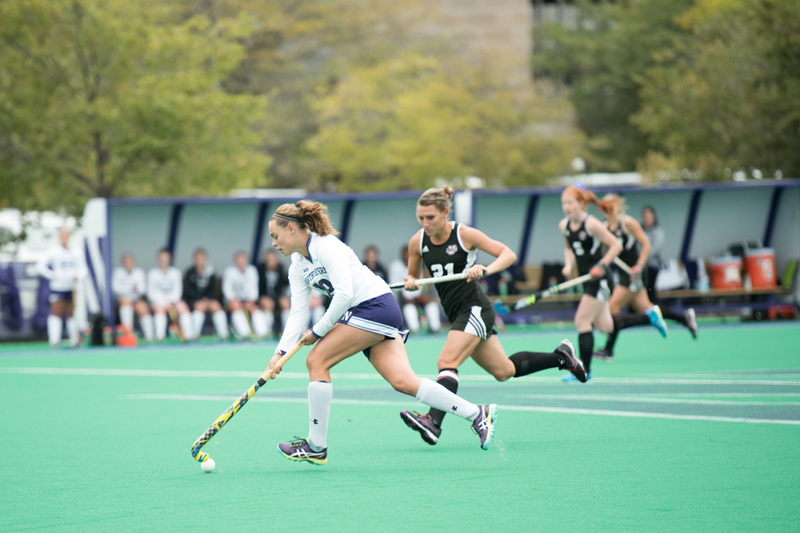 Against Iowa on Friday, Pentenga poured in three of the Wildcats’ five goals and added an assist to her weekend resume in Sunday’s game against Massachusetts, which NU won 2-1. Pentenga has been the driving force behind the No. 8 Cats’ offense this season, leading the team in shots, shots on goal and assists, and scoring the second-most goals. With 14 assists in 16 games, the junior leads the Big Ten in assists per game and ranks sixth in the country. Pentenga, however, deflected credit to her teammates. NU’s attack ranks 12th in the country in goals per game with 3.1. The offense has also excelled in drawing dangerous penalty corners, and ranks third in the country with 9.4 per game. Only No. 1 Connecticut and No. 3 Virginia generate corner opportunities at a higher rate. Pentenga is the fulcrum of the Cats’ attack on corner attempts, and many of her Big-Ten-leading 85 shots have come on the 150 corners the Cats have generated this season. NU will need Pentenga at her best this weekend, when it takes on No. 4 Michigan in pursuit of a Big Ten title.